When it comes to some of the terminology in Closed Circuit Television (CCTV) systems, it can be very confusing and often times the terms sound very similar. I often have customers call me asking for a motion detection camera that will follow a person that comes on to their property. 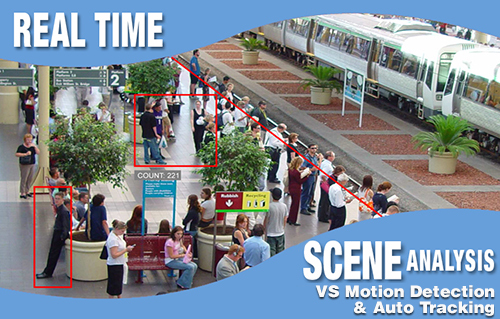 I am going to cover the main differences and similarities of motion detection, auto tracking, and analytics. With motion detection in a camera system, it is not like motion detection in an alarm system. With an alarm system there is a PIR (passive infrared) sensor that is send a beam into an area, when that beam is broken the sensor determines that motion has occurred. This beam can be changed with the amount of sensitivity that it has, this is generally utilized when someone has pets in their place and the don’t want to trip the sensors. With a camera system the motion detection is a little more simplistic, the camera is producing an image which the DVR (Digital Video Recorder) sees as an algorithm, when something changes in that algorithm the DVR determines this as a motion event. A simple cloud passing overhead can cause enough pixels in the image to change to have the algorithm change, making the DVR think that motion has occurred. If you have plants that blow in the wind, it can cause the algorithm to change. If you have anything that blows in the wind, the algorithm will change. Now you can adjust some of the settings in the DVR to help alleviate these false alerts. These settings can be found in the Main Menu, then go to Detect, then select the channel you want. You can adjust the sensitivity of the motion detection. If you have a Techpro Security DVR, the standard setting is at 3, which is a mid range sensitivity. If you are getting too many false alerts, you may try going to a 2 or 1. One is the least sensitive and six is the most sensitive setting is a Techpro DVR. If you are still getting false alerts, you may want to go into the motion detection and adjust the region of the image that is causing you the most problem. The factory default is to have the whole image shaded in Pink to detect motion detection. Any square that you deselect or that you can see the image with no color, you are deactivating the motion detection for. This is an image from the Web Service of the Motion Detection settings on one of my cameras. As you can see the tiles that have motion detection active in this image are blue, this is because when using the Web Service the shaded areas have a different color than at the DVR. You will also notice a different color if you are using TechproSS for PC to set the configurations as well. The results are still the same though. The top three rows in the motion detection on this image are deactivated, this is because I am not worried about anything causing motion in those areas. Now if someone or something were flying that low, then I may want to reconsider this. At this moment I don’t know of any thieves using jet packs!I generally will use a sensitivity of 1 on almost all of my cameras, this may not work for everyone, but it has served it’s purpose for me. One big false motion event will commonly occur at night, this is generally do to bugs loving the IR (Infrared) light that the cameras produce to help them see at night. Bugs and other insects also enjoy this light, now humans can’t see this light but this helps the camera to see when there is absolutely no light available and enhances any light available to it. Now if you want a camera that will follow or track an object that comes into it’s line of site, you will want an Auto Tracking PTZ ( Pan Tilt Zoom ) camera. These cameras are great for locations where there is not supposed to be movement. When an object changes the pixelization of the image the camera will respond and start “tracking” what changed the pixels. This is a great idea for a camera, but generally fails in several ways. The biggest failure of this camera is if 2 objects come into the camera’s line of sight and then move in opposite directions. The camera will follow the bigger of the objects not knowing which is more likely to cause the issue. Another failure with this type of camera is, if the camera is following an object and the object stops for a short time. The camera will default back to it’s home position, leaving the object to continue on unnoticed. In theory Auto Tracking PTZ’s are awesome, but in practicality they have some major faults. Now if you could add Analytics to this camera, you would have a phenomenal solution. Analytics is a program that runs in correlation with a DVR, that analyzes the images coming from the camera in real time to determine certain criteria. The different criteria can generally be set by the user to accomplish their needs. On some software you can set up different if statements that will react in different ways. For example, you can draw a line on the image, and say, “If an object passes this line going in this direction, then take a snapshot, record, and sound an alarm.” You can also put in an if statement like, “If an object passes this point and stays for this amount of time, sound an alarm, send an email, and record.” You can generally get as complex as you want with this type of software or stay as simplistic as you want. Some analytical software that I have seen will allow you to find a specific person and it will go through the recorded footage and give you that persons path every time they passed through that camera. Now the military and other government agencies have analytical software that would blow the general public’s mind. I have worked with a few ex-military special force guys, who explained briefly some of the things that the software they used could do. Some of the features in these programs are so advanced, that I think they will never reach the civilian market, but I am glad that they are being employed to keep our troops safe in the hostile environments we currently find ourselves in. I hope this article has helped to clarify the differences between these terms to help you better understand what you will need to have an effective security system. Motion Detection can be found on most surveillance systems on the market, Auto Tracking is a cool feature, but has many flaws, and Analytics is the best but can get very complex.